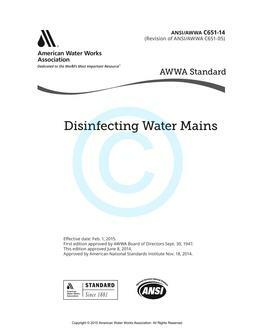 This standard for disinfection of water storage facilities covers materials, facility preparation, application of disinfectant to interior surfaces of facilities, and sampling and testing for the presence of coliform bacteria. The standard also includes disinfection procedures for underwater inspections of online, potable water storage facilities, but does not cover the technical aspects of underwater inspection. Appendices give information on chlorine dosages and disposal of heavily chlorinated water.